We have 2 sister companies that supply Woodchip fuel to Commercial, industrial and residential customers. With a base in the Scottish Highlands at Grantown on Spey, and a branch in Irvine this ensures that we can cover a vast area for our customers, in a variety of delivery vehicles to best suit the customer including bulk tippers and walking floor lorries. Our woodchip is BSL authorised, for full RHI compliance. range of chip specifications –G30, G50, G100, P16 or P45. We can supply 15%-40% moisture contents, for whatever suits your Boiler. 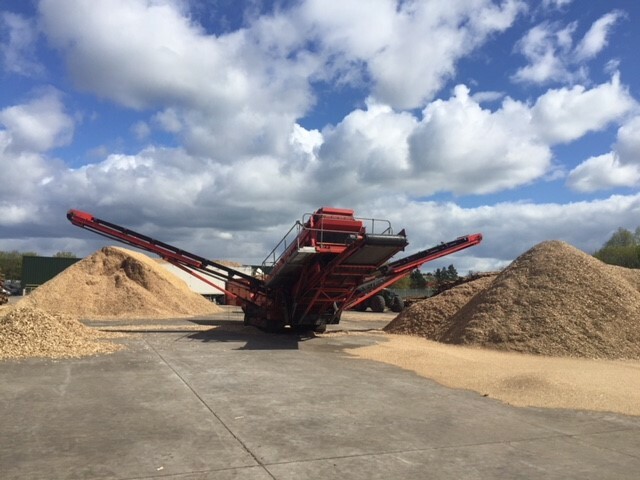 We are dedicated to producing and supplying top quality wood chip fuel. We offer a range of products and services suited to mainly commercial and industrial users and we also supply some domestic systems. Fuel Logs and RHI Compliance Dont know what they are can you please provide? All Raw timber supplies are from FSC Approved suppliers, we have a 10-year Guaranteed supply Agreement for Roundwood Log/Virgin Timber form A W Jenkinson Forest Products. We have two locations across Scotland, one in the Highlands at Grantown on Spey and a 2MW Drying Plant in Irvine, Ayrshire. This ensures that we can cover a vast area for our customers, in a variety of delivery vehicles to best suit the customer to include bulk tippers, blown deliveries and Artic walking floor lorries. Call us now for a competitive quote!! If you are in the early stages of installation it’s a good idea to check costs and accessibility of different delivery vehicles to your site before building your fuel store. We can advise on the best options and give you a quote so you know what costs to expect going forward. All too often we see expensive design flaws in chip stores, which can needlessly cost thousands extra in fuel costs per year, due to the delivery method chosen. We also offer free and impartial advice on fuel storage and delivery as well as maximizing Boiler Efficiencies and Calorific Values to help our customers get best value from their Biomass Investment. All Biomass Boilers require care and attention, we can provide a Service and Maintenance Contract, with quick response times to breakdowns. Further Information is available on request. 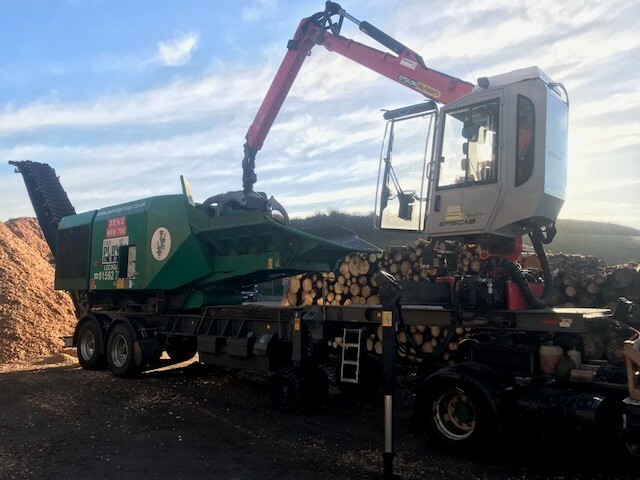 Our chipper is high powered and high producing – an impressive piece of kit! We are frequently asked about production capacity. Manufacturer’s guidance gives 50-60 tons per hour dependent on particle size required, this normally equates to 400 tons per day, but in practice volume is highly dependent on a variety of factors, such as timber species, moisture content and presentation of the timber. With No fines and NO oversized chips, we can ensure Boiler breakdowns will not be a result of your woodchip fuel from CWC Ltd.
Our chipper produces the very best quality chip, and the Screening Process ensures the correct Particle sizing and Drying to your Specified Moisture Content. By adjusting the cutting depth of the blades we can produce a full range of chip specifications- G30, G50 or G100. We can also supply a range of Moisture Contents, to meet each of our customers’ requirements, for whatever suits your Boiler. The correct specification is very important to ensure smooth auger in feed, preventing blockages and bridging within the fuel store. The recommended particle size for your particular boiler is also important to ensure optimum burning efficiency. We achieve a quality chip by not only using the necessary machinery, which must be carefully and regularly maintained, Our Highly trained and Experienced operators at our sites, ensure consistent Quality Control. Our Quality & Monitoring Policy provides useful guidance on how best to store timber and wood chip, ensuring that together we can achieve a premium quality product to ensure we get maximum production, without compromising on quality. Please note, we only process virgin timber. Waste or recycled wood is inherent with a high risk of damage to our machinery, and our Customers’ Boilers. Our high levels of Customer Service ensure we satisfy both private and commercial clients. With the majority of our customers being Hotels, Manufacturing Companies, Leisure Centre’s, Farms and Industrial, they can’t afford downtime on their heating systems. We are here to ensure that doesn’t happen! Therefore, it is imperative that we “Do what is says on the Tin” and make planned deliveries in a timely manner to our customers satisfaction. We can of course cover some emergency deliveries, if we have a late order due to unforeseen circumstances and endeavour to get to you in your hour of need. We are confident in our ability to satisfy all our clients with a quality service, and can happily provide references. Customer relations are a top priority to us and we will always seek to address any problems quickly and efficiently. We will guarantee fuel quality to the desired spec as per the contract and agree that it will be removed and replaced at no cost to the end user. If the delivery of our fuel is substandard, ie above +/- 5% of the MC specification we are happy to replace at no cost to customer. We have found that sustainable round timber supply is essential for our business and as such we have long term contracts for supply of raw timber to meet our wood chip requirements, in which case we always have a buffer stock. We have a 10 year supply agreement contract with AW Jenkinson Forest Products for supply of round wood log or chip at varied specification, and all logistical deliveries from AW Jenkinson and J Stevenson Haulage, means we have aligned our business with the best of breed wood supplier and delivery infrastructure, for guaranteed supply to our customers. We have also secured a sustainable supply in the Highlands from the Seafield Estate.